This project was a complete alteration to a 1980's contractor-designed home. The clients first approached us for a small remodeling project. The master bathroom was the first area to be updated. Translucent material encasing ginkgo leaves and reeds enhance the soothing, spacious room. The folded plane of the countertop creates a seat at one end and cantilevers into the shower at the other. The master suite is separated from the rest of the living space by a custom barn door that doubles as an illuminated wall accent. Once the project got under way, the clients became increasingly excited about their home's possibilities. The two and a half story high living room was formally cold and mostly unused. Now an array of hanging glass orbs twinkle like fire flies in the upper portion. Below, a lush, relaxed environment was created with the use of natural materials including sustainably harvested exotic woods wall panels and Venetian plaster. A built-in bench for relaxing anchors one end of the asymmetrical stone fireplace hearth while the opposite end cantilevers towards the main stairs. Daylight from multiple directions, Bay vistas and glimpses of the highlighted barn door upstairs add to the spatial drama. The new facade is simple and at the same time strong. 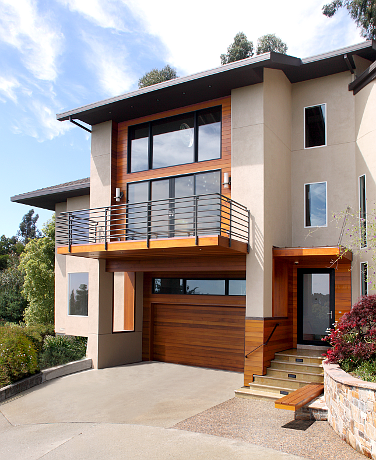 Cedar siding is used to emphasize the main portion and entry while the balance of the house in clad in stucco. Near the front door, a welcoming bench extends to provide a spot to relax in the sunshine. Translucent panels, wood panels set against plaster/stucco, and folded, cantilevered planes unify interior and exterior.